ART PIANO: Watch the newly released Jools Holland video! Watch the newly released Jools Holland video! Yamaha and Jools Holland celebrate 30 years of Clavinova with the ‘Me and My Piano’ video – a hugely entertaining and informative short film. Jools explains, in his own humorous and compelling manner, why and how he's used Clavinova pianos for over 20 years, and demonstrates the features and sounds that he finds so useful. As a British music icon and well-known champion of piano playing, Jools knows more than a thing or two about the instrument. This insightful film, made at his own studios in Greenwich, is essential viewing for anyone interested in learning how Jools approaches the instrument and finding out just why he loves the piano so much. Appealing to music fans and pianists of all abilities – and, unsurprisingly, packed with anecdotes – Jools talks about Squeeze, about composing, and about recording, all whilst previewing Yamaha’s latest flagship Clavinova. He enthuses about the instrument’s styles and sounds, including vintage organs, electric pianos and clavinets, and performs one of his most popular songs, Double O Boogie with his Rhythm and Blues Orchestra. He even duets with Shane McGowen, thanks to the Clavinova’s new audio playback feature! Watch the film now! We think it’s pretty cool. And it makes us smile. 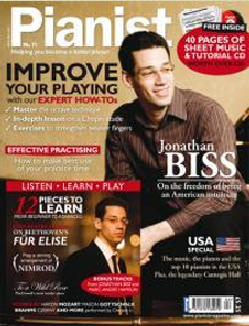 And watch this space… Jools Holland appears, big time, in the December issue of Pianist!